NCERT Solutions for Class 10 Science Chapter 6 Life Processes are provided here with simple step-by-step explanations. These solutions for Life Processes are extremely popular among class 10 students for Science Life Processes Solutions come handy for quickly completing your homework and preparing for exams. All questions and answers from the NCERT Book of class 10 Science Chapter 6 are provided here for you for free. You will also love the ad-free experience on Meritnation’s NCERT Solutions. All NCERT Solutions for class 10 Science are prepared by experts and are 100% accurate. Why is diffusion insufficient to meet the oxygen requirementsof multi-cellular organisms like humans? Multicellular organisms such as humans possess complex body designs. They have specialised cells and tissues for performing various necessary functions of the body such as intake of food and oxygen. Unlike unicellular organisms, multicellular cells are not in direct contact with the outside environment. Therefore, diffusion cannot meet their oxygen requirements. Any visible movement such as walking, breathing, or growing is generally used to decide whether something is alive or not. However, a living organism can also have movements, which are not visible to the naked eye. Therefore, the presence of life processes is a fundamental criterion that can be used to decide whether something is alive or not. An organism uses outside raw materials mostly in the form of food and oxygen. The raw materials required by an organism can be quite varied depending on the complexity of the organism and its environment. What processes would you consider essential for maintaining life? Life processes such as nutrition, respiration, transportation, excretion, etc. are essential for maintaining life. What are the differences between autotrophic nutrition and heterotrophic nutrition? Food is synthesised from simple inorganic raw materials such as CO2 and water. Food is obtained directly or indirectly from autotrophs. This food is broken down with the help of enzymes. Presence of green pigment (chlorophyll) is necessary. No pigment is required in this type of nutrition. Food is generally prepared during day time. Food can be prepared at all times. All green plants and some bacteria have this type of nutrition. All animals and fungi have this type of nutrition. Where do plants get each of the raw materials required for photosynthesis? • The raw material CO2 enters from the atmosphere through stomata. • Water is absorbed from the soil by the plant roots. • Sunlight, an important component to manufacture food, is absorbed by the chlorophyll and other green parts of the plants. What is the role of the acid in our stomach? 1. The hydrochloric acid present in our stomach dissolves bits of food and creates an acidic medium. In this acidic medium, enzyme pepsinogen is converted to pepsin, which is a protein-digesting enzyme. 2. The hydrochloric acid kills the harmful microbes that enter with food and thus prevents infection of digestive tract. What is the function of digestive enzymes? Digestive enzymes such as amylase, lipase, pepsin, trypsin, etc. help in the breaking down of complex food particles into simple ones. These simple particles can be easily absorbed by the blood and thus transported to all the cells of the body. How is the small intestine designed to absorb digested food? The small intestine has millions of tiny finger-like projections called villi. These villi increase the surface area for more efficient food absorption. 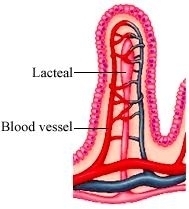 Within these villi, many blood vessels are present that absorb the digested food and carry it to the blood stream. From the blood stream, the absorbed food is delivered to each and every cell of the body. Terrestrial organisms take up oxygen from the atmosphere whereas aquatic animals need to utilize oxygen present in the water. Air contains more O2 as compared to water. Since the content of O2 in air is high, the terrestrial animals do not have to breathe faster to get more oxygen. Therefore, unlike aquatic animals, terrestrial animals do not have to show various adaptations for better gaseous exchange. 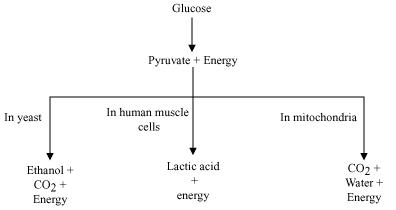 Glucose is first broken down in the cell cytoplasm into a three carbon molecule called pyruvate. Pyruvate is further broken down by different ways to provide energy. The breakdown of glucose by different pathways can be illustrated as follows. In yeast and human muscle cells, the breakdown of pyruvate occurs in the absence of oxygen whereas in mitochondria, the breakdown of pyruvate occurs in the presence of oxygen. Haemoglobin transports oxygen molecule to all the body cells for cellular respiration. The haemoglobin pigment present in the blood gets attached to four O2molecules that are obtained from breathing. It thus forms oxyhaemoglobin and the blood becomes oxygenated. This oxygenated blood is then distributed to all the body cells by the heart. After giving away O2to the body cells, blood takes away CO2which is the end product of cellular respiration. Now the blood becomes de-oxygenated. Since haemoglobin pigment has less affinity for CO2, CO2 is mainly transported in the dissolved form. This de-oxygenated blood gives CO2to lung alveoli and takes O2in return. The exchange of gases takes place between the blood of the capillaries that surround the alveoli and the gases present in the alveoli. Thus, alveoli are the site for exchange of gases. The lungs get filled up with air during the process of inhalation as ribs are lifted up and diaphragm is flattened. The air that is rushed inside the lungs fills the numerous alveoli present in the lungs. Each lung contains 300-350 million alveoli. These numerous alveoli increase the surface area for gaseous exchange making the process of respiration more efficient. The main components of the transport system in human beings are the heart, blood, and blood vessels. Heart pumps oxygenated blood throughout the body. It receives deoxygenated blood from the various body parts and sends this impure blood to the lungs for oxygenation. Being a fluid connective tissue, blood helps in the transport of oxygen, nutrients, CO2, and nitrogenous wastes. The blood vessels (arteries, veins, and capillaries) carry blood either away from the heart to various organs or from various organs back to the heart. Why is it necessary to separate oxygenated and deoxygenated blood in mammals and birds? Warm-blooded animals such as birds and mammals maintain a constant body temperature by cooling themselves when they are in a hotter environment and by warming their bodies when they are in a cooler environment. Hence, these animals require more oxygen (O2) for more cellular respiration so that they can produce more energy to maintain their body temperature. Thus, it is necessary for them to separate oxygenated and de-oxygenated blood, so that their circulatory system is more efficient and can maintain their constant body temperature. What are the components of the transport system in highly organised plants? 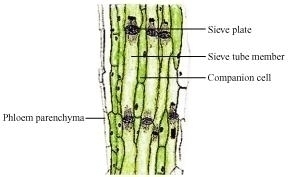 In highly organised plants, there are two different types of conducting tissues − xylem and phloem. Xylem conducts water and minerals obtained from the soil (via roots) to the rest of the plant. Phloem transports food materials from the leaves to different parts of the plant body. 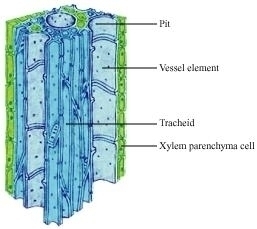 The components of xylem tissue (tracheids and vessels) of roots, stems, and leaves are interconnected to form a continuous system of water-conducting channels that reaches all parts of the plant. Transpiration creates a suction pressure, as a result of which water is forced into the xylem cells of the roots. Then there is a steady movement of water from the root xylem to all the plant parts through the interconnected water-conducting channels. Phloem transports food materials from the leaves to different parts of the plant body. The transportation of food in phloem is achieved by utilizing energy from ATP. As a result of this, the osmotic pressure in the tissue increases causing water to move into it. This pressure moves the material in the phloem to the tissues which have less pressure. This is helpful in moving materials according to the needs of the plant. For example, the food material, such as sucrose, is transported into the phloem tissue using ATP energy. Nephrons are the basic filtering units of kidneys. Each kidney possesses large number of nephrons, approximately 1-1.5 million. The main components of the nephron are glomerulus, Bowman’s capsule, and a long renal tubule. The blood enters the kidney through the renal artery, which branches into many capillaries associated with glomerulus. 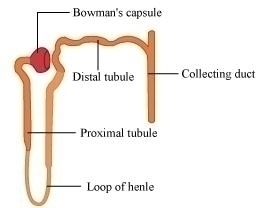 The water and solute are transferred to the nephron at Bowman’s capsule. In the proximal tubule, some substances such as amino acids, glucose, and salts are selectively reabsorbed and unwanted molecules are added in the urine. The filtrate then moves down into the loop of Henle, where more water is absorbed. From here, the filtrate moves upwards into the distal tubule and finally to the collecting duct. Collecting duct collects urine from many nephrons. The urine formed in each kidney enters a long tube called ureter. From ureter, it gets transported to the urinary bladder and then into the urethra. Plants can get rid of excess of water by transpiration. Waste materials may be stored in the cell vacuoles or as gum and resin, especially in old xylem. It is also stored in the leaves that later fall off. How is the amount of urine produced regulated? The amount of urine produced depends on the amount of excess water and dissolved wastes present in the body. Some other factors such as habitat of an organism and hormone such as Anti-diuretic hormone (ADH) also regulates the amount of urine produced. (c) In human beings, the kidneys are a part of the system for excretion. (a) In a plant, the xylem is responsible for transport of water. (d) The autotrophic mode of nutrition requires carbon dioxide, water, chlorophyll and sunlight. (b) The breakdown of pyruvate to give carbon dioxide, water and energy takes place in mitochondria. How are fats digested in our bodies? Where does this process take place? Fats are present in the form of large globules in the small intestine. The small intestine gets the secretions in the form of bile juice and pancreatic juice respectively from the liver and the pancreas. The bile salts (from the liver) break down the large fat globules into smaller globules so that the pancreatic enzymes can easily act on them. This is referred to as emulsification of fats. It takes place in the small intestine. Saliva is secreted by the salivary glands, located under the tongue. It moistens the food for easy swallowing. It contains a digestive enzyme called salivary amylase, which breaks down starch into sugar. Autotrophic nutrition takes place through the process of photosynthesis. Carbon dioxide, water, chlorophyll pigment, and sunlight are the necessary conditions required for autotrophic nutrition. Carbohydrates (food) and O2 are the by-products of photosynthesis. It occurs in the presence of O2. It occurs in the absence of O2. It involves the exchange of gases between the organism and the outside environment. Exchange of gases is absent. It occurs in cytoplasm and mitochondria. It occurs only in cytoplasm. It always releases CO2 and H2O. It yields only 2 ATPs. Anaerobic respiration occurs in the roots of some waterlogged plants, some parasitic worms, animal muscles, and some micro-organisms such as yeasts. How are the alveoli designed to maximise the exchange of gases? The alveoli are the small balloon-like structures present in the lungs. The walls of the alveoli consist of extensive network of blood vessels. Each lung contains 300−350 million alveoli, making it a total of approximately 700 million in both the lungs. The alveolar surface when spread out covers about 80 m2 area. This large surface area makes the gaseous exchange more efficient. What would be the consequences of a deficiency of haemoglobin in our bodies? Haemoglobin is the respiratory pigment that transports oxygen to the body cells for cellular respiration. Therefore, deficiency of haemoglobin in blood can affect the oxygen supplying capacity of blood. This can lead to deficiency of oxygen in the body cells. It can also lead to a disease called anaemia. 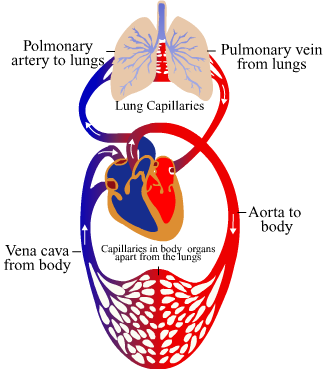 The human heart is divided into four chambers − the right atrium, the right ventricle, the left atrium, and the left ventricle. The heart has superior and inferior vena cava, which carries de-oxygenated blood from the upper and lower regions of the body respectively and supplies this de-oxygenated blood to the right atrium of the heart. The right atrium then contracts and passes the de-oxygenated blood to the right ventricle, through an auriculo-ventricular aperture. Then the right ventricle contracts and passes the de-oxygenated blood into the two pulmonary arteries, which pumps it to the lungs where the blood becomes oxygenated. From the lungs, the pulmonary veins transport the oxygenated blood to the left atrium of the heart. Then the left atrium contracts and through the auriculo-ventricular aperture, the oxygenated blood enters the left ventricle. 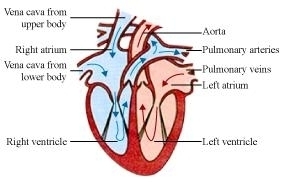 The blood passes to aorta from the left ventricle. The aorta gives rise to many arteries that distribute the oxygenated blood to all the regions of the body. Therefore, the blood goes twice through the heart. This is known as double circulation. The separation of oxygenated and de-oxygenated blood allows a more efficient supply of oxygen to the body cells. This efficient system of oxygen supply is very useful in warm-blooded animals such as human beings. As we know, warm-blooded animals have to maintain a constant body temperature by cooling themselves when they are in a hotter environment and by warming their bodies when they are in a cooler environment. Hence, they require more O2 for more respiration so that they can produce more energy to maintain their body temperature. Thus, the circulatory system of humans is more efficient because of the double circulatory heart. Xylem tissue helps in the transport of water and minerals. Phloem tissue helps in the transport of food. Water is transported upwards from roots to all other plant parts. Food is transported in both upward and downward directions. Transport in xylem occurs with the help of simple physical forces such as transpiration pull. Transport of food in phloem requires energy in the form of ATP. (i) Alveoli are tiny balloon-like structures present inside the lungs. (ii) The walls of the alveoli are one cell thick and it contains an extensive network of blood capillaries. (i) The exchange of O2 and CO2 takes place between the blood of the capillaries that surround the alveoli and the gases present in the alveoli. 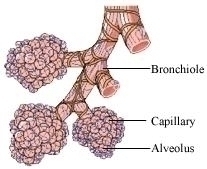 (ii) Alveoli are the site of gaseous exchange. (i) Nephrons are tubular structures present inside the kidneys. 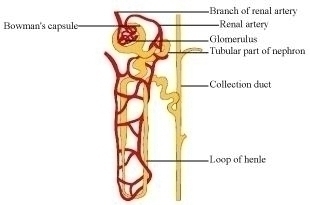 (ii) Nephrons are made of glomerulus, bowman’s capsule, and a long renal tube. It also contains a cluster of thin-walled capillaries. (i) The blood enters the kidneys through the renal artery which branches into many capillaries in the glomerulus. The water and solute are transferred to the nephron at Bowman’s capsule. Then the filtrate moves through the proximal tubule and then down into the loop of henle. From henle’s loop, filtrate passes into the distal tubule and then to the collecting duct. The collecting duct collects the urine from many nephrons and passes it to the ureter. During the flow of filtrate, some substances such as glucose, amino acids, and water are selectively re-absorbed. (ii) Nephrons are the basic filtration unit.